Woburn Abbey has been home of the Dukes of Bedford for over 300 years and is now lived in by the present Duke's heir, the Marquess of Tavistock and his family, in the Family Rooms. The house's history began in 1145 when Hugh deBolebec built an abbey here for Cistercian monks. The abbey was confiscated in 1538 under the orders of King Henry VIII for 'treasonable utterances' and given to Sir John Russell for services to the crown in 1547. It became the family seat of the Russell family in 1619. In 1747 it was partially reconstructed and extended by the Palladian architect Henry Flitcroft who built Woburn Abbey into most of what we see today. The next major building period was in 1786 under the direction of Henry Holland and although some of Holland's work had to be demolised in 1949 his influence remains in the Canaletto room and Library. Henry Holland was also closely involved in the design and construction of Broadlands. Aside from Windsor Castle, the most visited attraction in the Home Counties is Woburn Abbey, which is so spectacular you should try to visit even if you have to miss all the other historic homes described in this guide. 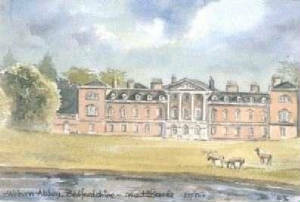 The great 18th-century Georgian mansion has been the traditional seat of the dukes of Bedford for more than 3 centuries. 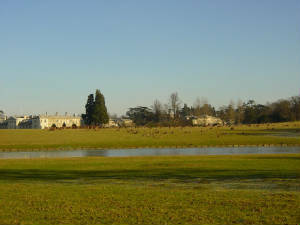 Woburn's 3,000 acre deer park was landscaped by Humphry Repton in the early 19th century, and contains an abundance of wildlife, including nine species of deer. One of these, the Pere David, descended fnum the Imperial Herd of China, was saved from extinction at Woburn and is now the largest breeding herd in the world. Then, with Henry 8th’s declaration as Supreme Head of the English Church, at the Dissolution the fate of the Abbey was finally sealed and when Henry’s commissioners came to Woburn they found twelve monks, the abbot and the sub prior. Eleven monks were freed but the other three were tried, found guilty and hanged from a tree at the entrance to the priory. Now known as Abbot’s Oak, the tree still remains, some two hundred yards from the west front of the building and supposedly that of the Abbot, a ghostly figure, in a long brown robe, is said to haunt the Abbey. 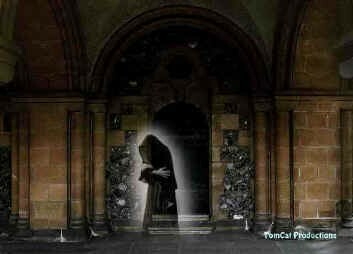 Sightings in the crypt and the Sculpture Gallery have been reported. After the Dissolution the interests of the Abbey were granted - by royal award - to a Dorset squire, John Russell, who was eventually created Earl of Bedford, in 1550. By marriage, he preferred to live at Chenies, in Buckinghamshire and so the second Earl was quite thrown into a state of near panic when, in 1572, the neglected property at Woburn received a visit from Queen Elizabeth. After this regal arrival the Abbey again lay forgotten and in 1585, burdened by debt, the second Earl died. In time it would be left to the fourth Earl to restore Woburn’s fortunes, having made it’s acquaintance whilst escaping an epidemic of plague in London. Apart from various restorations he also made plans to construct a ninety room mansion, the largest in the county. Unfortunately he died from smallpox in 1641 and during those days of the Civil War his son, the 5th. Earl, pledged allegiance to the Parliamentary cause. However, he later reversed his loyalties and having joined the Royalists had to flee abroad. After the Restoration he then returned to England and by the restored monarchy was made Duke of Bedford and Marquess of Tavistock. By marriage his son acquired much property in London and both Russell Square and Bedford Row are two present reminders. 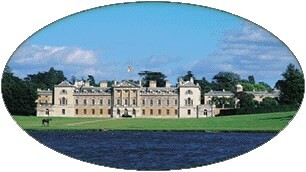 Eventually it was the fourth Duke of Bedford, John, who began the rebuilding of Woburn Abbey. Much had to be demolished but nevertheless the resulting reconstructions preserved the quadrangular plan. His grandson became the 5th. Duke and although not given to a scholarly disposition was nevertheless fond of home entertainments, installing his mistress in a wing of the Abbey! Yet he commissioned the famed Henry Holland to add the east front of the Abbey and in the form of a broad, sweeping semi circle, the main entrance to the Park. His brother, John, inherited the estate in 1802 and engaged Humphrey Repton to lay out a suitably impressive approach to the west front. John’s third son, also John, twice became Prime Minister but it was Francis, the eldest son, who inherited Woburn and a heavy burden of debt, despite which incumberance he still had to provide a ‘lavish entertainment’ when Queen Victoria and Prince Albert came to visit. The 7th. Duke was succeeded in 1861 by his son William who built the magnificent church of Woburn between 1865/66 at a cost of £40,000. Somewhat of a recluse, William transferred the management of the estates to his cousin, Francis Charles Hastings. In time he became the 9th. Duke but unfortunately he later went mad and in 1891 shot himself. Succeeded by his eldest son, George, when he died suddenly, two years later, in the absence of children the inheritance then passed to his brother Herbrand, rather disrespectfully termed ‘Hatband’ by his fellow associates, when serving in the Grenadier Guards. In time he became the 11th. Duke and not one for modern improvements, he refused to install central heating in the Abbey and instead during the winters relied on nearly eighty wood fires. As for other modern improvements, an early attempt to install electricity came to an abrupt end, when a section of the wiring caught fire, and at a later attempt, since the Duke would allow no workmen to be seen in his presence, whenever he approached those laying the cables had to scurry into a cupboard! In poor health, Herbrand died in 1940 and after the war the Abbey had deteriorated to such a degree that much reconstruction was needed and in fact the eastern wing had to be demolished. Tragically the Duke died from a gunshot wound whilst out hunting and although he had made provisions to escape estate duties, he died before these could take effect. As a result his son, the 13th. Duke, inherited a tax bill of 4 million pounds and as for the Abbey, the whole of the east front had now gone and at least a third of the north and south wings. With everywhere in chaos and disorder, by sheer determination the Duke organised a clearing up and renovation such that in 1955 the Abbey opened to fare paying visitors of the public, the first arriving in two cars and a bike! 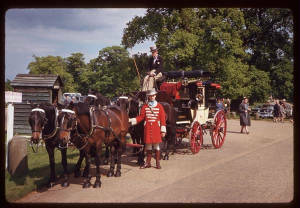 In recent years The Safari Park has been but one added attraction and on the retirement of his parents, the Marquess and Marchioness of Tavistock, the estate is now under the management of Lord Howland. Then, with Henry 8th’s declaration as Supreme Head of the English Church, at the Dissolution the fate of the Abbey was finally sealed and when Henry’s commissioners came to Woburn they found twelve monks, the abbot and the sub prior. Eleven monks were freed but the other three were tried, found guilty and hanged from a tree at the entrance to the priory. Now known as Abbot’s Oak, the tree still remains, some two hundred yards from the west front of the building and supposedly that of the Abbot, a ghostly figure, in a long brown robe, is said to haunt the Abbey. Sightings in the crypt and the Sculpture Gallery have been reported. After the Dissolution the interests of the Abbey were granted - by royal award - to a Dorset squire, John Russell, who was eventually created Earl of Bedford, in 1550. The house contains one of the most important private collections of furniture, porcelain, silver and paintings, by many famous craftsmen and artists, including Claude, Cuyp, Gainsborough, Murillo, Rembrandt, Reynolds and Deniers to name only a few and in one room of the Private Apartments, the magnificent Venetian Room, there are 21 paintings of Venice by Antonio Canale (Canaletto). Woburn has been home to distinguished visitors in the past, including Queen Victoria and Prince Albert, who used a suite of rooms here. 300 years and is reputedly haunted by a number of ghostly forms . cannot be seen, doors open and close for him as he walks through rooms.